It argues that our notions of when to start potty training are much more to do with parental readiness than that of a child’s maturation, and suggests that helping your baby use a potty from birth, leading to gentle, non-coercive potty training from around 18 months (if even necessary), is the best way to meet a child’s developmental needs both physically and psychologically. In terms of training, this depends what the expectations are of the process and outcome. In the conventional sense, it means teaching a child to use a potty or toilet rather than a diaper ("nappy" in the UK) and thereby eliminating the need for diapers thereon. As Kachmar highlights, many potty training “experts” or advisors propose that children cannot achieve this until 18 months 1 at the earliest and to do it earlier is not only futile, but potentially harmful (more on this in a moment). However, the practice of helping a young baby use a potty (what we know as “elimination communication”) can often mean that babies have developed a capacity to be reliably clean and dry much earlier than this. These babies have not necessarily been “trained” in the way we have come to expect. Is your child over 18m? Start potty training today with this book which will show you step by step how to do it gently, swiftly and be done with diapers for good! Brazelton published the first paper recommending the approach, advocating for potty training from 18 months. He acknowledged that sphincter control could be developed by 9m of age and suggested that the optimum time to start potty training was in fact between 12-18 months. The main piece of research supporting Brazelton’s potty training recommendations was based on a small, relatively homogeneous population, with no control group and performed only once in the 1960s. Since then, there have been very few studies assessing the efficacy of the method, with the first ever systematic review of toilet training strategies for healthy children finding just 6 related studies. Ironically, if you look closely at the Brazelton technique, you will see that nearly all of the steps in the process are in fact initiated by parents, not children.10 This would appear to support the notion of parent-led potty training from a very young age. Perhaps ‘readiness’ has less to do with what babies are capable of, and more to do with adult attitudes towards engaging their babies with the process of learning toileting skills? Does delaying the onset of potty training disrespect our children’s own developmental capabilities? Are our efforts to avoid over-burdening young children with the task of toileting actually taking away important opportunities to develop readiness skills? DEVELOPMENTAL READINESS: IS THIS AGE DEPENDENT? Wu (2012) highlights that if we break down the 28 separate toilet-readiness signs proposed by “readiness” methods, half of these signs occur between 12-24 months of age. However, if the requisite skills of independence have been removed, they can be observed as young as 9 months. Wu (2012) concludes that based on signs of readiness, “a reasonable approach would be for parents to consider toilet training when their child is able to communicate the need to urinate and is able to stay dry during a nap, or for 2 h during the day.”11 In my experience (and that of many other parents who practice infant toileting), babies clearly communicate the need to eliminate from birth, and can develop the ability to stay dry for 2 hours from around 6 months if they are regularly encouraged to void in a potty rather than a diaper. Imagine that you are teaching your child to ride a bike. Would you buy them a child-sized bike? Would you teach them about safety? Would you give them plenty of chance to practice in accordance with their developmental level? Or would you simply wait till they were old enough to acknowledge these things for themselves before you even introduced the concepts? Like many approaches to skill acquisition, I think you’d be more likely to start as soon as you saw an opportunity, recognizing there is a journey of skill development involved before independence can be readily and gently achieved. So in relation to helping children succeed with independent toileting, there is surely a similar trajectory in terms of preparation? An international study by Rugolotto et al. of nearly 300 caregivers who helped their infants use a potty demonstrated that it was possible to recognize a baby’s cues and offer a potty.12 Furthermore, It is possible to replicate the approaches used by non-westernised cultures, as demonstrated by Smeets et al (1985) in her observations of 3-7m infants in the Netherlands13. You can read more detail on the available scientific literature in support of potty training in other cultures here. Did you know you can start baby pottying anytime? 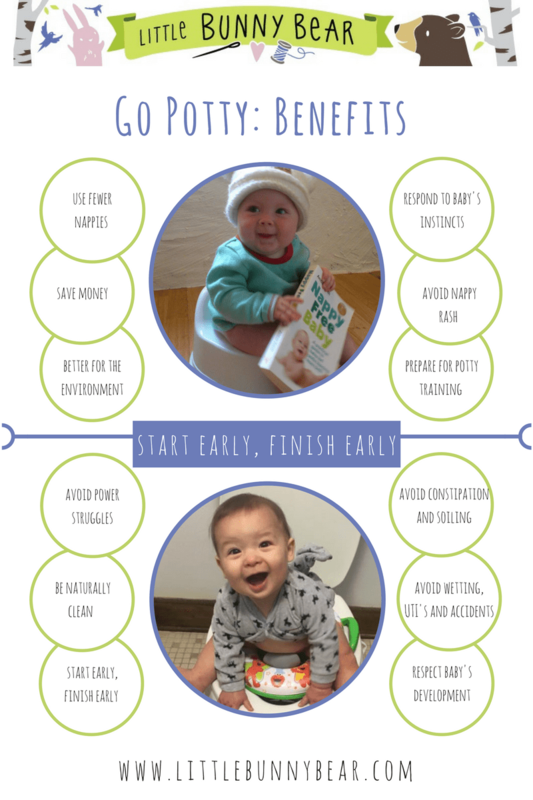 That you can do it part-time and still use diapers until your baby is ready to potty train? Find out how. Difficult to argue with that isn’t it? I’m not trying to make you feel guilty, but I do think we have a collective responsibility to leave a better world behind for the future. If parents simply started potty training sooner, we’d instantly reduce the environmental impact by half. Even if you’re trading this having already completed potty training (yey! ), it’s never too late to pass this message on to those with babies still to reach this milestone. I believe that when babies are given regular opportunity to void in something other than a diaper, instead of teaching them to ignore their instincts and bodily signals, we help them to maintain their awareness which not only respects their innate capabilities but gently leads to readiness for potty training much sooner. Earlier potty training is also shown to reduce the incidence of toileting resistance 21 or stool toileting refusal which requires medical resolution22.Late training, on the other hand, has been shown to result in more daytime wetting relapses and incontinence, and a longer duration of toilet training23. Download Rebecca's FREE Go Potty Guide. Download Andrea's FREE Easy Start Guide. Find out how to start developing readiness skills by pottying your baby part time and still using diapers. “The only thing that is damaging is chronic holding, which as this study mentioned, is not more likely to happen in earlier potty learners. Bladder problems such as infections and incontinence are actually more common in later potty learners (here, here, here, and others). The evidence says exactly the opposite of what he is claiming”25. There is another fundamental flaw in all of his research: it is based on his knowledge of children who have urinary and bowel problems, not normal healthy children. So can his research be generalized to larger, healthier populations? Wait? So it’s actually more to do with effective voiding than the timing of potty training? Well, this is very convenient for parents to help their baby go potty, as research has shown that using a squatting position (as practiced by parents using this method) aids complete voiding.26. What if we consider what humans did for 100,000’s of years before diapers were invented? If the suggestion is that potty training prior to 18 months is damaging, would that not mean that you, your parents, grandparents, and basically all generations before you, not to mention the 75 countries in the world who routinely use no diapers at all, are all psychologically damaged? Dr .Hodges conveniently dismisses this idea, blaming it instead on diet and access to toileting facilities. Again, these suggestions are more to do with avoiding chronic constipation and urine holding than the age at which potty training is initiated. In fact, both these dangers can be avoided by gentle non-coercive potty training at an age when there is least likely to be resistance (i.e. before 24 months). Changes in potty training practices have been less driven by scientific data than by popular ideas of whether permissive or strict parenting was better.29. Parentingscience.com gives a good overview of the arguments for and against early potty training, and concludes “there is no evidence that early potty training harms children”. Rather, such ideas are based on opinion rather than rigorous scientific research. They come down to a gross misrepresentation in the media fuelled by multi-million dollar investment in promoting disposable diapers. I would argue that the real danger lies in waiting too long (but that, of course, would sell fewer diapers, wouldn’t it?). “Have you considered whether or not your previous or current potty training views might be shaped by the disposable diaper industry? Would the realization that you and other parents are being somewhat influenced by powerful for-profit industry rather than scientifically-grounded, sound medical advice change your opinions?”(Kachnar, Maria, 2018, Lose the Diapers!). A study by Largo and Stutzle in 1977 confirmed that the introduction of disposable nappies and media campaigns were the main contributors to delayed potty training. The promotion of a convenient single-use product that reduces or eliminates laundry and the required parent-led potty training approach has provided many parents with a justification to delay. I wouldn’t go so far as to say they were lazy, although this has been suggested. On the whole, I’d suggest it’s because many parents struggle to perceive a benefit in starting early. Furthermore, they are not aware of the potential pitfalls of delaying, particularly in relation to the development of healthy voiding capacity. Want to know more about how to reduce disposable diaper use? Visit the NHS website advice for potty training and you will find that it concludes there is “no perfect time” to train. Likewise, the Institute of Health Visitors says there is “no set time to start the process” but that “18m is a good time to start”. Importantly, both officials recommend encouraging the development of “readiness skills”, something I would argue is absolutely intrinsic to helping a young baby use a potty instead of a diaper, from both a physical and psychological perspective. Parentingscience.com argues that “passive waiting does nothing to help your baby “get ready“. There will always need to be some element of teaching to the process which is parent, not child, led. We can either teach our babies to use a diaper, or we can teach them that wearing a portable toilet is not the only choice. Find out how to start here or download my FREE Go Potty Guide. We should not confuse elimination communication with potty training – the two are very different. The research underpinning the “wait for readiness” approach originally recommended initiating potty training from 12 months. However, the study did not consider non-verbal signs or the experience of parents who practice elimination communication that demonstrates that infants show signs of readiness from birth. 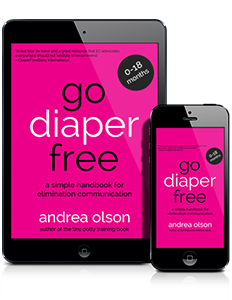 Thank you to other experts cited in this article for their research and writing on Elimination Communication and Potty Training, in particular Andrea Olson of Go Diaper Free and Maria Kachmar (Lose the Diapers! ), for supporting this piece. Buy the book I recommend for babies 0-18m, or the potty training book for 18m and up – a great practical guide to potty training - both come with access to real support from a real GDF Coach. Benjasuwantep B, Ruangdaraganon N.(2011) Infant toilet training in Thailand: Starting and Completing Age and Factors Determining Them. J Med Assoc Thai.2011 Dec;94(12):1441-6. Rebecca is potty blogger and owner of Little Bunny Bear Go Potty. She has two children, both of whom have used potty from birth. She is a trained seamstress, clothing designer, registered Children's Nurse and Potty Training Specialist. She lives in Leeds, UK. When I learned of EC, it felt like common sense! And now once my babe gives me his signals, I have to actively ignore them to not recognize them. It’s absurd for anyone to say that it could be harmful, that is simply a misunderstanding what what EC is and clearly some major misinformation from the diaper industry. This post is very informative and exactly what I was looking for to help explain myself to friends and family. There’s so much judgment surrounding trying something that is not culturally the norm, and having research to back it up helps me feel confident in my decision to practice EC with my 5 month old. Yes Haley!!! You are so welcome. When Rebecca wanted to allow me to repost this I was thrilled. Finally a scientific justification in favor of EC and early toilet learning, and a dismissal of Dr Steven Hodges’ bogus recommendation to not start toilet training til 3 years old. And all the rest too. Def show this to everyone and share away!!! Thank you so much Andrea for promoting EC around the world. We need everyone to know about it as it is good for our babies and it can help us produce less waste. I love this article because it dismantles the #1 or only reason why people are afraid or against EC. Thank you! “We should not confuse elimination communication with potty training – the two are very different.” How are they very different? I feel like they are very close on the same spectrum. Not without reason EC is called “infant potty training” and “baby-led potty trianing”, too. And I mean that in a positive way. Thank you very much for this post/ and Rebecca for all the research and summary! In regards to the development of the child (a certain set of physical and cognitive skills ) I felt with mine they actually had “more brain capacity” for learning new stuff BECAUSE their minds were at ease about elimination and not “blocked” thinking of their need rather than the task at hand. Also I really like/prefer the term in this article “potty learning” to “potty training” as it discribes the situation more accurately. We show, we point, we lead by example. And the child takes from it what he/she needs for her individual development(al stage). Is this possible if my child is still nursing and nurses all night? She is 17 months old.